With the increased use of smartphones and social media as well as other technologies, a range of new anxieties have been born, while other anxieties are being made worse. There are various ways to know if technology is causing you anxiety. Each of the symptoms below are paired with a certain kind of anxiety. If you regularly struggle to turn away from your phone, computer or other devices and enjoy the moment at hand, you could have disconnection anxiety. Platforms like Facebook and Twitter are designed to constantly engage you, with ongoing sounds, flags and push notifications about messages to check, comments made on your posts, and so on. Your brain can become conditioned to anticipate these sounds and visual cues, and to become addicted to them, leading to anxiety when you have to remove yourself from them and focus on something else. On the other hand, the constant interruptions in of themselves can make it hard to concentrate. Are you finding yourself swearing at each notification? It might be time to silence those, or turn the contraption off completely. Phones, tablets, laptops and the great WiFi in the subway as you head home from work, are all solid reasons why it is easy to keep working once you get home (or, if you’re a freelancer like me, when you leave home). Yet we need to switch off and have boundaries between the various spheres of our lives — between work, play, rest and social times. Further, if we already have some anxiety at work, this technology can mean we are bringing that anxiety around everywhere. This sort of anxiety has a range of layers. It starts when you are with a partner or friend and both of you are using your phones instead of talking to each other. You’re physically close to each other, but you aren’t communicating. Meanwhile, platforms like Instagram, as well as dating apps, place an emphasis on photos and selfies and therefore on personal appearance and fairly quick and superficial memories. Though the platforms may seem highly personalized, the consequences for how we interact with other people and how we view ourselves, socially, can be quite depersonalizing and transactional. People also tend to compare themselves to others on social media, despite the fact that photos and videos shared present an incomplete picture, and a skewed view of reality. Finally, for teens and younger people, social media can affect your development of social skills (that is, the lack of such development), making social situations difficult and riddled with anxiety. 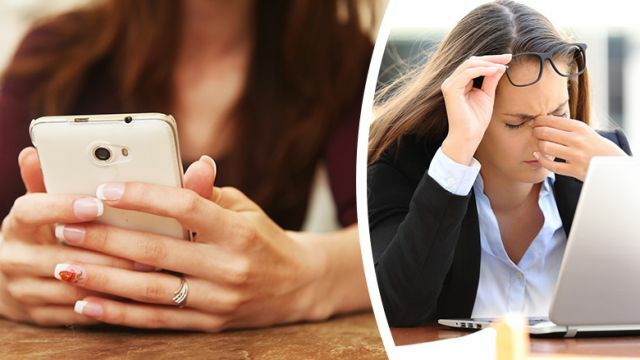 According to Learning-Mind.com, most people panic when their phone battery drops below 20 percent, half of mobile phone users get anxious without their phone, and 45 percent of people feel uncomfortable or worried without access to email or Facebook. Two-thirds of people experience nomophobia, which is an irrational fear of being without your phone. Technology has trained us to expect instant results, and we can therefore experience frustration and anxiety when we have to wait a while for a computer to boot or a pot of coffee to boil, or worse, in a two-hour line at the bank. Road rage is becoming more common as a result, while attention spans are getting shorter. The first step to combating this sort of stress and anxiety is recognizing that it is there, and naming it — so this article is a great start! From there, setting reasonable limits to your use of social media and your phone can be really beneficial. Make certain times of day — such as meal times, or after 9 p.m. at night — technology-free, or limit Facebook to the half an hour after you’ve done everything you needed to in your day. Apps like RescueTime can also help you monitor your use of various sites and help you change your habits. Beyond that, how you help yourself will depend on your own individual needs, but there are a range of general anxiety-relieving techniques you can employ. Exercise, regular human contact and a healthy amount of curiosity about your surroundings are vital tools. Yoga, running, hiking, dancing and strength training have been proven to be particularly beneficial. Further, herbs like hops, passion flower and skullcap are great for easing nervous tension and anxiety. Hey Buddy!, I found this information for you: "5 Signs Technology Is Making Your Anxiety Worse". Here is the website link: https://www.thealternativedaily.com/5-signs-technology-is-making-your-anxiety-worse/. Thank you.